Unix (all-caps UNIX for the trademark) is a family of multitasking, multiuser computer operating systems that derive from the originalAT&T Unix, developed in the 1970s at the Bell Labs research center by Ken Thompson, Dennis Ritchie, and others. Initially intended for use inside the Bell System, AT&T licensed Unix to outside parties from the late 1970s, leading to a variety of both academic and commercial variants of Unix from vendors such as the University of California, Berkeley (BSD), Microsoft (Xenix),IBM (AIX) and Sun Microsystems (Solaris). AT&T finally sold its rights in Unix to Novell in the early 1990s, which then sold its Unix business to the Santa Cruz Operation (SCO) in 1995, but the UNIX trademark passed to the industry standards consortium The Open Group, which allows the use of the mark for certified operating systems compliant with the Single UNIX Specification. Among these is Apple's OS X, which is the Unix version with the largest installed base as of 2014. Many clones of Unix have arisen over the years, of which Linux is the most popular, having overtaken the popularity of "true" Unix on server platforms since its inception in the early 1990s. Originally, Unix was meant to be a programmer's workbench to be used for developing software to be run on multiple platformsmore than to be used to run application software. The system grew larger as the operating system started spreading in the academic circle, as users added their own tools to the system and shared them with colleagues. Unix was designed to be portable, multi-tasking and multi-user in a time-sharing configuration. Unix systems are characterized by various concepts: the use of plain text for storing data; a hierarchical file system; treating devices and certain types of inter-process communication (IPC) as files; and the use of a large number of software tools, small programs that can be strung together through acommand-line interpreter using pipes, as opposed to using a single monolithic program that includes all of the same functionality. These concepts are collectively known as the "Unix philosophy". Brian Kernighan and Rob Pike summarize this in The Unix Programming Environment as "the idea that the power of a system comes more from the relationships among programs than from the programs themselves". By the early 1980s users began seeing Unix as a potential universal operating system, suitable for computers of all sizes. Unix operating systems are widely used in servers, workstations, and mobile devices. The Unix environment and the client–server program model were essential elements in the development of the Internet and the reshaping of computing as centered in networks rather than in individual computers. Under Unix, the operating system consists of many utilities along with the master control program, the kernel. The kernel provides services to start and stop programs, handles the file system and other common "low-level" tasks that most programs share, and schedules access to avoid conflicts when programs try to access the same resource or device simultaneously. To mediate such access, the kernel has special rights, reflected in the division between user space and kernel space. The microkernel concept was introduced in an effort to reverse the trend towards larger kernels and return to a system in which most tasks were completed by smaller utilities. In an era when a standard computer consisted of a hard disk for storage and a data terminal for input and output (I/O), the Unix file model worked quite well, as most I/O was linear. However, modern systems include networking and other new devices. As graphical user interfaces developed, the file model proved inadequate to the task of handling asynchronous events such as those generated by a mouse. In the 1980s, non-blocking I/O and the set of inter-process communication mechanisms were augmented with Unix domain sockets, shared memory, message queues, and semaphores. In microkernel implementations, functions such as network protocols could be moved out of the kernel, while conventional (monolithic) Unix implementations have network protocol stacks as part of the kernel. The pre-history of Unix dates back to the mid-1960s when the Massachusetts Institute of Technology, AT&T Bell Labs, and General Electric were developing an experimental time-sharing operating system called Multics for the GE-645 mainframe. Multics introduced many innovations, but had many problems. Frustrated by the size and complexity of Multics but not by the aims, Bell Labs slowly pulled out of the project. Their last researchers to leave Multics, Ken Thompson, Dennis Ritchie, M. D. McIlroy, and J. F. Ossanna, decided to redo the work on a much smaller scale. In 1970, Peter Neumann coined the project name UNICS (UNiplexed Information and Computing Service) as a pun on Multics(Multiplexed Information and Computer Services): the new operating system was an emasculated Multics. In 1972, Unix was rewritten in the C programming language. The migration from assembly to the higher-level language C resulted in much more portable software, requiring only a relatively small amount of machine-dependent code to be replaced when porting Unix to other computing platforms. Bell Labs produced several versions of Unix that are collectively referred to as Research Unix. In 1975, the first source license for UNIX was sold to faculty at the University of Illinois Department of Computer Science. UIUC graduate student Greg Chesson (who had worked on the UNIX kernel at Bell Labs) was instrumental in negotiating the terms of this license. During the late 1970s and early 1980s, the influence of Unix in academic circles led to large-scale adoption of Unix (BSD and System V) by commercial startups, includingSequent, HP-UX, Solaris, AIX, and Xenix. 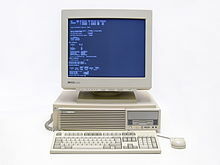 In the late 1980s, AT&T Unix System Laboratories and Sun Microsystems developed System V Release 4 (SVR4), which was subsequently adopted by many commercial Unix vendors. In the 1990s, Unix-like systems grew in popularity as Linux and BSD distributions were developed through collaboration by a worldwide network of programmers. In 2000, Apple released Darwin that became the core of the OS X operating system. Beginning in the late 1980s, an open operating system standardization effort now known as POSIX provided a common baseline for all operating systems; IEEE based POSIX around the common structure of the major competing variants of the Unix system, publishing the first POSIX standard in 1988. In the early 1990s, a separate but very similar effort was started by an industry consortium, the Common Open Software Environment (COSE) initiative, which eventually became the Single UNIX Specification administered by The Open Group. Starting in 1998, the Open Group and IEEE started the Austin Group, to provide a common definition of POSIX and the Single UNIX Specification. The inclusion of these components did not make the system large – the original V7 UNIX distribution, consisting of copies of all of the compiled binaries plus all of the source code and documentation occupied less than 10 MB and arrived on a single nine-track magnetic tape. The printed documentation, typeset from the on-line sources, was contained in two volumes. Document formatting – Unix systems were used from the outset for document preparation and typesetting systems, and included many related programs such as nroff,troff, tbl, eqn, refer, and pic. Some modern Unix systems also include packages such as TeX and Ghostscript. Providing the software at a nominal fee for educational use. Being easy to adapt and move to different machines. It was written in a high level language rather than assembly language (which had been thought necessary for systems implementation on early computers). Although this followed the lead of Multics and Burroughs, it was Unix that popularized the idea. Making the command interpreter an ordinary user-level program, with additional commands provided as separate programs, was another Multics innovation popularized by Unix. The Unix shell used the same language for interactive commands as for scripting (shell scripts – there was no separate job control language like IBM's JCL). Since the shell and OS commands were "just another program", the user could choose (or even write) his own shell. New commands could be added without changing the shell itself. Unix's innovative command-line syntax for creating modular chains of producer-consumer processes (pipelines) made a powerful programming paradigm (coroutines) widely available. Many later command-line interpreters have been inspired by the Unix shell. Unix popularized a syntax for regular expressions that found widespread use. The Unix programming interface became the basis for a widely implemented operating system interface standard (POSIX, see above). The C programming language soon spread beyond Unix, and is now ubiquitous in systems and applications programming. The TCP/IP networking protocol was quickly implemented on widely used versions of Unix on relatively inexpensive computers, which contributed to the Internet explosion of worldwide real-time connectivity, and which formed the basis for implementations on many other platforms. In 1983, Richard Stallman announced the GNU project, an ambitious effort to create a free software Unix-like system; "free" in the sense that everyone who received a copy would be free to use, study, modify, and redistribute it. The GNU project's own kernel development project, GNU Hurd, had not produced a working kernel, but in 1991 Linus Torvalds released the Linux kernel as free software under theGNU General Public License. In addition to their use in the Linux operating system, many GNU packages – such as the GNU Compiler Collection (and the rest of the GNU toolchain), the GNU C library and the GNU core utilities – have gone on to play central roles in other free Unix systems as well. Linux distributions, consisting of the Linux kernel and large collections of compatible software have become popular both with individual users and in business. Popular distributions include Red Hat Enterprise Linux, Fedora, SUSE Linux Enterprise, openSUSE, Debian GNU/Linux, Ubuntu, Linux Mint, Mandriva Linux, Slackware Linux, MEPIS, and Gentoo. OpenSolaris was the open-source counterpart to Solaris developed by Sun Microsystems, which included a CDDL-licensed kernel and a primarily GNU userland. However,Oracle discontinued the project upon their acquisition of Sun, which prompted a group of former Sun employees and members of the OpenSolaris community to fork OpenSolaris into the illumos kernel. As of 2014, illumos remains the only active open-source System V derivative. 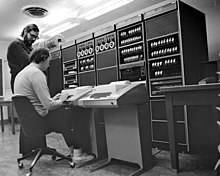 In May 1975, RFC 681 described the development of Network Unix by the Center for Advanced Computation at the University of Illinois. The system was said to "present several interesting capabilities as an ARPANET mini-host". At the time Unix required a license from Bell Laboratories that at $20,000(US) was very expensive for non-universityusers, while an educational license cost just $150. It was noted that Bell was "open to suggestions" for an ARPANET-wide license. Efficient file system and access control. Unified treatment of peripherals as special files. The network control program (NCP) was integrated within the Unix file system. Network connections treated as special files which can be accessed through standard Unix I/O calls. The system closes all files on program exit. "desirable to minimize the amount of code added to the basic Unix kernel". In October 1993, Novell, the company that owned the rights to the Unix System V source at the time, transferred the trademarks of Unix to the X/Open Company (now The Open Group), and in 1995 sold the related business operations to Santa Cruz Operation (SCO).Whether Novell also sold the copyrights to the actual software was the subject of a 2006 federal lawsuit, SCO v. Novell, which Novell won. The case was appealed, but on 30 Aug 2011, the United States Court of Appeals for the Tenth Circuit affirmed the trial decisions, closing the case. Unix vendor SCO Group Inc. accused Novell of slander of title. The present owner of the trademark UNIX is The Open Group, an industry standards consortium. Only systems fully compliant with and certified to the Single UNIX Specification qualify as "UNIX" (others are called "Unix system-like" or "Unix-like"). By decree of The Open Group, the term "UNIX" refers more to a class of operating systems than to a specific implementation of an operating system; those operating systems which meet The Open Group's Single UNIX Specification should be able to bear the UNIX 98or UNIX 03 trademarks today, after the operating system's vendor pays a substantial certification fee and annual trademark royalties to The Open Group. Systems licensed to use the UNIX trademark include AIX, HP-UX, IRIX, Solaris, Tru64 (formerly "Digital UNIX"), A/UX,OS X, and a part of z/OS. Sometimes a representation like Un*x, *NIX, or *N?X is used to indicate all operating systems similar to Unix. This comes from the use of the asterisk (*) and the question mark characters as wildcard indicators in many utilities. This notation is also used to describe other Unix-like systems, e.g., Linux, BSD, etc., that have not met the requirements for UNIX branding from the Open Group.